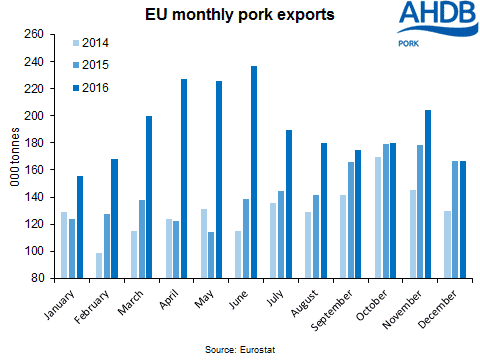 EU - At over 2.3 million tonnes, EU pork export volume grew by a third on the year during 2016. Tightening supplies in the latter half of the year elevated pig prices, counteracting the poor prices seen at the start of the year. Hence overall, value was up in line with volume, at €5.2 billion. Shipments to the growing Far East markets were key to boosting the EU’s export performance last year. Chinese volumes were up 86 per cent to almost 990 thousand tonnes, and there were also more modest increases in shipments to Japan and South Korea of 9 per cent and 16 per cent respectively. However export growth did slow as the year progressed, with volumes only up 5 per cent on the year for Q4 alone. This was due to increasing competition from US pork and some slowdown in growth in the Chinese market. These challenges are likely to remain in 2017, particularly as some recovery in Chinese pork production is anticipated in the latter half of the year. Likewise, offal shipments also grew 18 per cent year-on-year during 2016, almost reaching 1.4 million tonnes. Again, the Asian market was crucial to this overall growth, with shipments to China and neighbouring Hong Kong combined up 30 per cent. Together, these two destinations made up over three quarters of the EU offal export market. While pig fat exports remained below the levels seen before the Russian import ban, they were also bolstered by the growth in Chinese demand last year. Shipments to China almost trebled on 2015 volumes, reaching 95,000 tonnes. Coupled to a more modest increase in exports to the Philippines, this growth countered a 19 per cent decline in shipments to the Ukraine. Overall, this meant volumes were up 17 per cent on the year at just over 250,000 tonnes.